Last month, malady I posted some traditional summer rolls made with carrot, infection cucumber, rice noodles and cilantro. While delicious, I had a hard time handling the rice paper. Thanks to some fabulous tips from Ami, I managed to make them much more quickly and efficiently this time. I also wanted to experiment with the fillings, so I went with mango, basil and tea-infused rice noodles. I soaked the rice noodles in a strong brew of Lapsang Souchong tea, which gave them a smoky and almost spicy flavor that made a nice contrast to the mango and basil. I also sprinkled some of the dried tea leaves over the filling before wrapping the rolls for extra flavor. Since it was a weeknight and I was feeling a bit lazy, I made a simple dipping sauce by combining Ponzu and Sriracha. Ponzu is a citrusy Japanese sauce made from Shoyu, Mirin, rice vinegar and yuzu. It salty, tart and a little bit sweet. All in all, I think I like these little mango rolls. They were different and refreshing, but still felt as light as the traditional version. Tom thought they were too “herbal” because I used 2 basil leaves per roll. I suppose I agree, so I adjusted the recipe here to call for 1 basil leaf per roll. Feel free to play with the ingredients, or to substitute Chai or another strong black tea if you can’t find Lapsang Sauchong. In honor of the 4th of July, I’ll be posting something decidedly non-American on Friday, but perfect for beach snacking: homemade empanadas with 3(!) kinds of filling. Yum! Make the rice noodles. Pour the boiling water in a bowl and steep 3 of the tea bags for 5 minutes, then submerge the noodles in the tea for 10 minutes. Drain. Set a plate in front of your bowl of warm water and make sure all of your ingredients are ready and near your work area. Quickly submerge a rice paper into the warm water and lay it on the plate. You’ll want to keep the filling to the first half of the sheet so that you’ll have room to wrap and seal the rolls. Also be careful not to overfill, or your summer roll wonâ€™t seal and youâ€™ll have a bit of a mess on your hands. 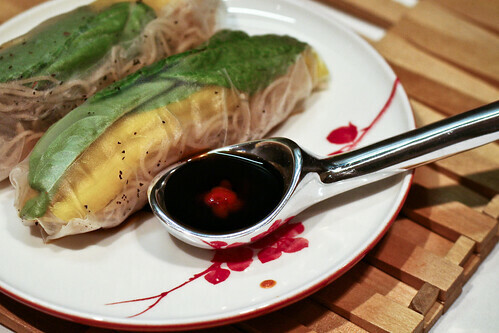 Place a basil leaf on the rice paper, then 3 – 4 strips of mango, then a bit of rice noodles. Sprinkle with a small pinch of tea leaves and wrap them up like you would a burrito. Start rolling it tightly from the side with the most stuffing on it. Once youâ€™re 1/3 of the way wrapped, tuck in the edges and finish rolling it. You should have what looks like a (pretty!) tightly wrapped burrito. Serve with Ponzu and Sriracha. This sounds so good and refreshing on a hot summer day in Miami. Looking forward to your empanada recipes! I love the idea of making tea-infused noodles – I think I might try it with some genmaicha tea, which is also slightly smoky and savory. Also, just wanted to say that I’m so glad I found your blog (I think it was through Foodgawker?) I am also a whole-grain fanatic, and your recipes look wonderful! Mia – I’ve never had genmaicha tea, but I’ll keep my eyes out. I love a strong, smoky tea. Glad you’re enjoying the blog! I love the idea of soaking the noodles in lapsang souchong – I love that smoky flavour! I tried smoking duck breast with earl grey a while ago and that was delicious! I made some rolls like this and they were delicious – more tea in cooking! Interesting. I love to steep noodles in strong juice as part of dessert. I bet this would be equally good.